When you’re 30,000 feet in the air, the last thing you want is to feel stressed, cramped and trapped in less-than-ideal accommodations. Sometimes, flying can be a test of your patience and mental strength. But it doesn’t have to be. Best of all, you may not have to pay extra for those extra amenities when you start by searching online for the best deals. Enter business class. The more comfortable middle ground between run-of-the-mill coach and budget-busting first class, business class offers premium amenities that can make your inflight experience much more enjoyable. These perks often include priority check-in before your flight, space for additional baggage, access to a private VIP lounge, bigger (and more comfortable!) 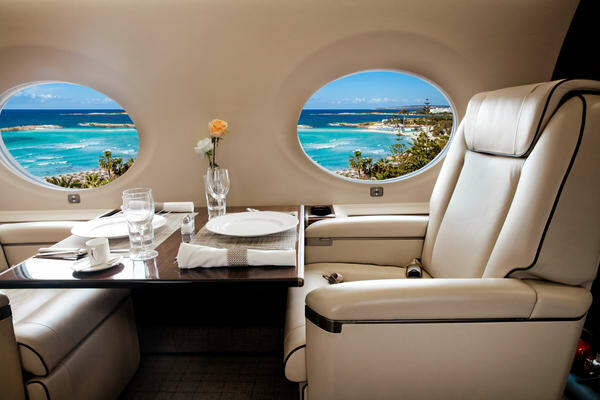 seats on the plane, access to special menus, free champagne when you board and much, much more. Sounds like a fantasy, right? Well, it doesn’t have to be. In fact, airlines rarely fill all their business class seats, and are sometimes forced to offer them for much lower rates. And these seats can be yours if you play your cards right. Here’s how to score business class tickets on a coach budget. Often, airlines won’t book all of the seats on a flight, especially those more expensive seats in business class. When this happens, they might offer a last-minute deal or flash sale to fill the seats — these tickets will usually cost less than what they’re worth. Sign up for emails from a variety of airlines to be notified immediately when this happens. No, this doesn’t mean you never have to come home from vacation (though we definitely wouldn’t blame you). Instead, this is just a way to find lower rates on more premium tickets. Often, it’s cheaper to book a one-way flight anyway, and booking separate tickets for your round-trip flight will give you more flexibility in your schedule — and more opportunities to find the best deal. While this may seem like more work, it’s totally worth it. Forget your favorites — they may not be offering the best bang for your buck. Instead, search online for deals on business class tickets, and don’t be afraid to branch out from your usual airlines. Sometimes smaller, less popular airlines offer better prices since they don’t have the big corporate markups that larger airlines do. Sign up for an airline credit card. If you frequently fly one airline over all of the others, you should really consider signing up for an airline-specific credit card. Depending on the company, this can help you earn double or triple the points every time you make a purchase — thus increasing your odds of qualifying for deals on a business class flight. After purchasing a flight, some airlines will give you the option to buy additional points that can be applied to your account. These points often get sold at a much lower price than they would have cost outside of a regular ticket — so the more you buy, the quicker they add up (and the quicker you’d be able to use them to a buy a business class ticket). You know what they say: It never hurts to ask. When you arrive at the ticket counter the day of your flight, ask the people working if there are any free upgrades to business class. You just never know when there will be seats they’ll want to fill last-minute for much, much less.